Mettler Toledo provides full service coverage worldwide to its customers, supports them with a customized, lifelong service management and assists them in managing measurement loops throughout the whole life-cycle. 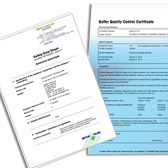 By using the below links you will find different certificates and data sheets such as quality certificates for buffer solutions and electrolytes (LOT number required), material safety data sheets (MSDS), product and material related certificates (ATEX, PROFIBUS, 3-A etc.) as well as product related declarations of conformity (CE).